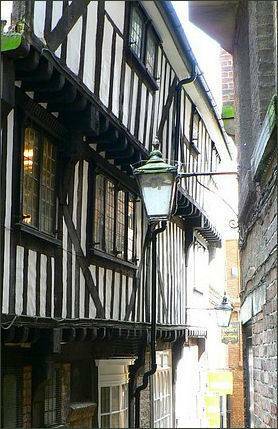 The Snickelways of York are a collection of small streets and footpaths in the city. The word Snickelway was coined by local author Mark W. Jones in 1983 in his book 'A Walk Around the Snickelways of York', and is a combination of the words snicket, a northern English dialect word for a narrow passage, ginnel, a narrow passageway between or through buildings, and alleyway. The book provides an excellent account of the unusual pathways that make up the city. 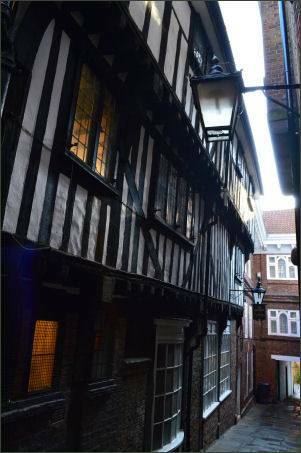 York has a multitude of Snickelways, which link many parts of the city to each other, most date from the mediaeval era, although there are some modern paths as well. They often bear quaint names such as Mad Alice Lane, named after a woman hanged in 1823 for poisoning her husband, Nether Hornpot Lane, Pope's Head Alley and Finkle Street. 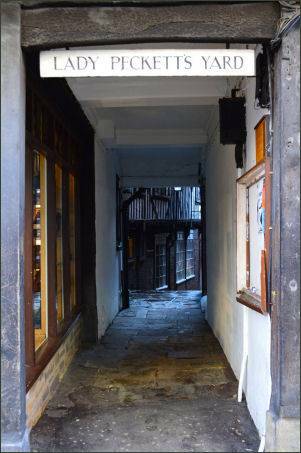 Little Peculiar Lane, off Petergate is the shortest of all York's snickelways and the most attractive due to its excellent view of York Minster. The adjacent pub, the Hole in the Wall, which is likely to be a reference to Bootham Bar, was once known as 'The Board Inn' and is reputed to be haunted by the mysterious footsteps. Excavations of the Board Inn carried out in 1816 revealed a dark secret. A hole was discovered which led to a dungeon, where chains and manacles hung. A tunnel was also found which was bricked up. Coffee Yard is the longest Snickelway at nearly 220 feet (67 metres) long, leading off Stonegate, it contains a reconstructed medieval townhouse, Barley Hall, which was originally built in about 1360 by the monks of Nostell Priory, a monastery near Wakefield. 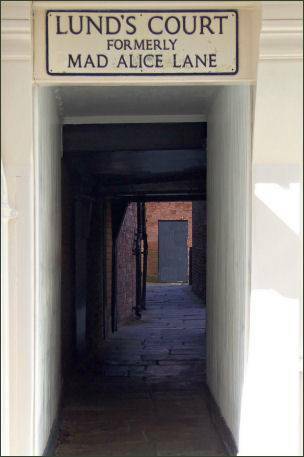 Pope's Head Alley, measuring only 80cm wide this is one of the narrowest and darkest of York's streets. Francis Drake mentions it briefly in 'Eboracum', his history of the city. It is a favoured haunt of many of the ghost walks in the city. Three Cranes Lane leads from Swinegate to St Sampson's Square, which was once a market square, called Thursday Market. Each of the snickelways has its own story, Finkle Street, leading from St.Sampson's Square to Swinegate, comes from the Anglo-Saxon word for Crooked Street, 'Winkel'. It was also once known as Mucky Pig Lane for its connection to the pig market. Lady Peckett's Yard runs south-east from Pavement and is connected to Fossgate by a lane. It is named after Alice Peckett, wife of John Peckett, Lord Mayor of York in 1701, who died in 1759. The nearby Golden Fleece pub has named one of its rooms as Lady Peckett's Room. Bedern Passage, a Snickelway between Goodramgate's shops, leads to Bedern Lane and the remains of Bedern Chapel which was consecrated in 1349 as the Chapel of the College of the Vicars Choral of York Minster. The chapel was the centre of a large monastic-like complex where the medieval vicars lived and worked.